Eva Proudman has worked within the hair industry for more than 10 years and has a wealth of experience about the sourcing of hair and solutions for adding hair to those suffering from Hair Loss. Eva is passionate about providing solutions for clients with hair loss and has developed the team in the services offered, constantly looking to expand the portfolio of services to meet the demands of our clients. Eva is experienced at sourcing human hair and is in charge of ensuring that our European Hair supply is maintained with our trusted network of suppliers, and that all of our hair is ethically sourced. Eva Proudman has also developed and written our NVQ Level 2 Introduction to Wig Making Course and can often be found delivering modules to our students, or delivering enrichment days to NVQ Level 3 students in the many hairdressing colleges around the country. Eva has a natural empathy with hair loss and is always seeking out knowledge to help and assist our clients as well as to develop her team. Favourite Food: Anything cooked by her Son who is a chef. 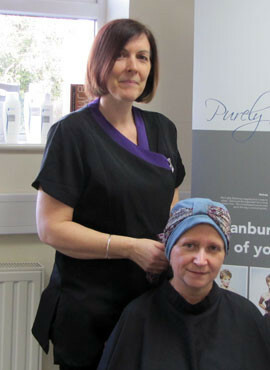 Lorrayne has been with Banbury Postiche for 20+years and now works in our Hair Room as an expert Hair Preparer. For the past 2 years Lorrayne has worked under the guidance of Jenny and Debbie who have been hand preparing human hair for more than a combined total of 50 years, there isn’t anything that we cannot colour or pattern match to, providing that we can source the all important raw hair. Lorrayne also works as a wig consultant, bringing her experience into the fitting rooms and really relating to the importance of matching hair to the clients’ exact requirements. Myra has been hand making human hair wigs for more than 30 years, she fulfils the role of production manager here at Banbury and is absolutely passionate about helping anyone with long term hair loss to achieve their ideal wig or hairpiece. Sue has been designing for the fashion industry since the tender age of just 16, having qualified as a seamstress and bridal wear designer, we were lucky enough to tempt her to our team over 9 years ago. Sue designs and makes a fantastic range of headwear, keeping pace with the current catwalk trends and colours to suit every season. Sue has also been trained to be one of our wig consultants and works in fitting both real hair custom made wigs as well as acrylic wigs. 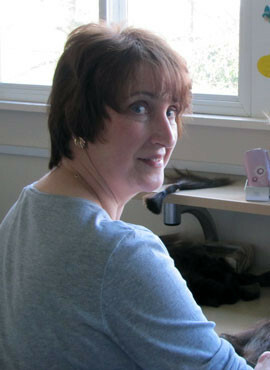 If you have a special occasion and need headwear making for it, Sue does offer a fantastic custom made service.